CouponsandOffers is the PUP that uses misleading techniques to prevent removal. Use Reimage to locate malicious components and get rid of them faster than with uninstall instructions. A full system scan blocks virus reappearance and prevents traffic to malicious domains. How did CouponsandOffers hijack my computer? CouponsandOffers is an adware that claims to be designed to enhance your shopping experience – because it saves your time and money. Sadly, it is just a nice description, but in reality the aim of this program is completely different. There are several points why this program is very suspicious. First of all, in most cases you will not know that you have agreed to install this adware. Secondly, after the installation, this potentially unwanted program (PUP) will attach to any of your internet browsers (Google Chrome, Mozilla Firefox, Internet Explorer, etc) and will start collecting information about your browsing experience. It will record your search terms, your browsing history, your downloads, bookmarks that you save, and your IP address as well. Later, the developers of this application share this information with their third-party partners and generates targeted advertisements for you. You will see these advertisements on your browser window, on any web pages you will go to. This PUP will interrupt your browsing experience by showing intrusive ads by CouponsandOffers – pop-ups, banners, in-text links and so on. On top of that, it is right to say that these advertisements may lead you to infectious websites with questionable content. We advise you not to click on any of CouponsandOffers ads – in case if you do, there’s a possibility only one click may result into an infection or an execution of a potentially dangerous threat for your PC. There’s a solution to avoid a situation like that – if you care about your cyber-security, you should install a reputable anti-malware tool, for example, Reimage. This application will detect and remove computer threats, so you won’t have to worry about dangers for your security. Programs like CouponsandOffers generally travel together merged with other legitimate applications in one pack. It is called bundling – it’s a popular method used by app distributors to promote potentially unwanted programs like adware, add-ons, plug-ins, browser extensions or browser hijackers. Luckily, we can share information with you on how to prevent it. It doesn’t take much time or effort, just a little more caution. When you decide to download a certain freeware from the web, make sure you have found the official website. Otherwise, you may end up downloading a bundled program pack. Also, if you want to make sure that you will install only the preferred program without additional software, here’s how to do it: when you install a new program, make sure you choose „custom“ or „advanced“ settings instead of „default“ or „standard“. The window should expand, and you should see a list of agreements to install various plug-ins, additional apps, browser extensions and so on. Untick all of them. That’s it, that’s how you can ensure that none of potentially unwanted programs will invade your computer. In case you didn’t know this prevention method before, do not worry. It is still possible to fix everything and recover your computer’s performance. 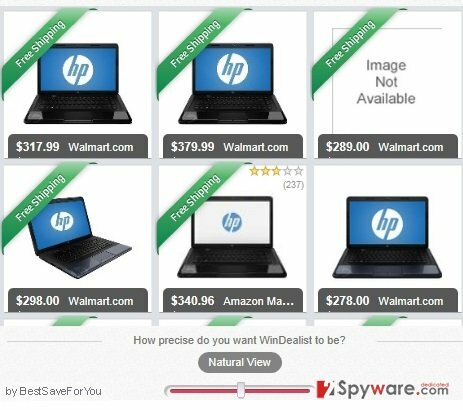 You can either uninstall CouponsandOffers manually, but there’s a chance that you won’t be able to recognise all of the CouponsandOffers files; or you can use an anti-spyware program which will do all the necessary safety work for you. However, if you decide to do it on your own, our professionals have prepared detailed instructions on how to do it. You will find them below this article. Here, look for CouponsandOffers or any other recently installed suspicious programs. Wait until you see Applications folder and look for CouponsandOffers or any other suspicious programs on it. Now right click on every of such entries and select Move to Trash. When in the new window, check Delete personal settings and select Reset again to complete CouponsandOffers removal. Once these steps are finished, CouponsandOffers should be removed from your Microsoft Edge browser. Here, select CouponsandOffers and other questionable plugins. Click Remove to delete these entries. Now you will see Reset Firefox to its default state message with Reset Firefox button. Click this button for several times and complete CouponsandOffers removal. Here, select CouponsandOffers and other malicious plugins and select trash icon to delete these entries. Click Reset to confirm this action and complete CouponsandOffers removal. Here, select Extensions and look for CouponsandOffers or other suspicious entries. Click on the Uninstall button to get rid each of them. Now you will see a detailed dialog window filled with reset options. All of those options are usually checked, but you can specify which of them you want to reset. Click the Reset button to complete CouponsandOffers removal process. This entry was posted on 2015-10-02 at 00:14 and is filed under Adware, Viruses. You can quickly scan the QR code with your mobile device and have CouponsandOffers manual removal instructions right in your pocket. How did you remove CouponsandOffers?